The most common skull makeup is a full face. 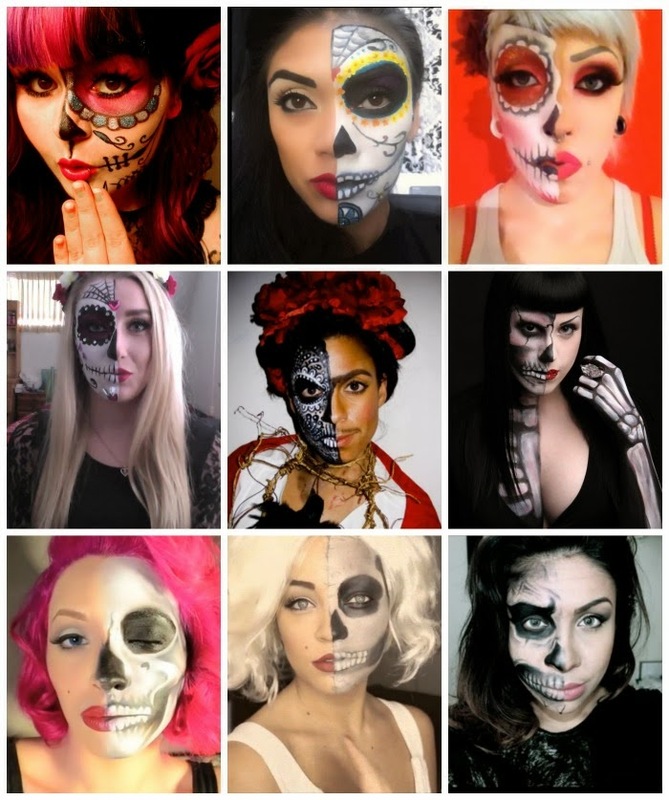 When I saw several amazing looks that are half skull, half human, I knew they deserved a tutorial roundup post of their own. When Dia de los Muertos and Halloween quickly approaching, I hope these give you some inspiration to create your own skull looks. I've done several skull makeups myself, and the best product to create an even white base is Ben Nye's cream makeup. I bought some at a local costume shop, but it can be purchased online too. The cheap Halloween makeups don't provide even coverage, so don't waste your money. You can get the white in a single pot, or in a multi-pack, which will be handy for a full look. Don't forget to set your makeup with powders and eyeshadow. It will last a long time without creasing and running. 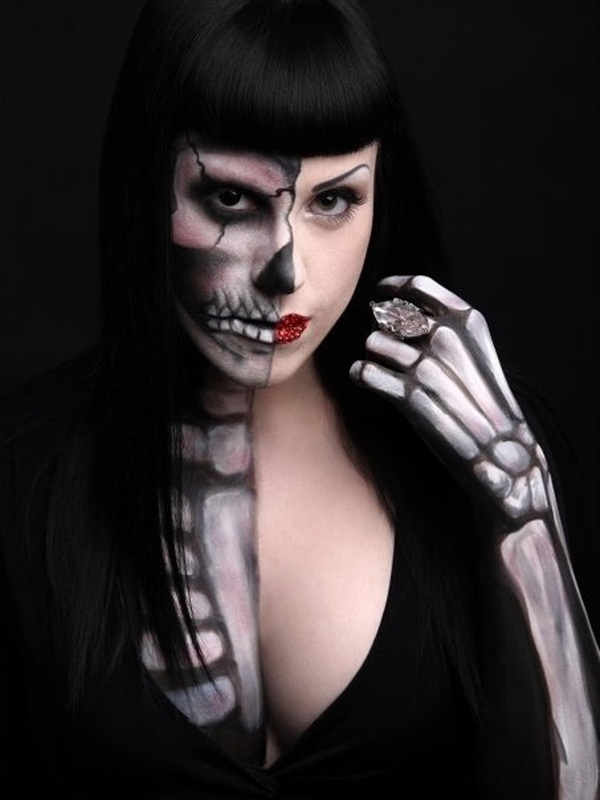 Skull makeups always get a lot of attention, so you want it to be photo and party ready! Ok, on with the tutorials and inspiration! One of my favorite things about Dia de los Muertos are the colorful candy sugar skulls. There is a lot artwork inspired by them, including much of mine. 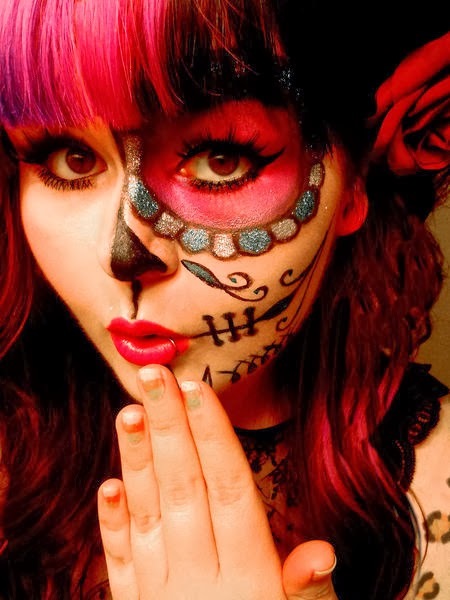 The most popular Dia de los Muertos makeup I come across is also inspired by the cheerful sugar skulls. 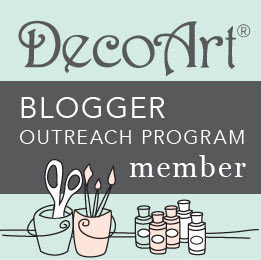 These tutorials will show you how to create a half sugar skull, but look at artwork to create your own look. This half skeleton makeup by Kat Von Pire inspired me to write this half of the post. There is no tutorial to recreate this look, but the video tutorials will give you some inspiration and instructions to create your own look.